What’s in the blue packets? #ScarletWitch needs to work on her aim. “Victory at the expense of the innocent is no victory at all.” So true. The #SokoviaAccords. Ah...now I know what they were talking about on #AgentsofSHIELD. “Sometimes I want to punch you in your perfect teeth.” The seeds of civil war. “I’m not the only Winter Soldier,” says Bucky. The others are Lucky, Ducky, Plucky and Klucky. #CaptainAmerica kisses #AgentCarter’s niece. He’s a multigenerational lover. “It’s your conscience. We don’t talk a lot these days.” Hilarious! I’m missing #Hulk in this movie. It needed some #GreenRage. “I’ll put you on hold...I like to watch the line blink.” Good one, #Stark. #IronMan takes a shield to the heart. That round goes to #CaptainAmerica. Final analysis: an overlong and overstuffed actioner that actually has a lot of social relevance. Rating: 3 out of 4. #CaptainAmerica gets upstaged in his own movie, which is really #Avengers3. 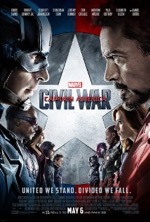 Captain America (Chris Evans) and his team of superheroes face off against Iron Man (Robert Downey Jr.) and his super friends on an airport tarmac and maximum destruction ensues. The end. Well, there’s a little bit more to it than that, but you get the main gist of the story from that nutshell synopsis of Captain America: Civil War, the newest chapter in the Marvel movie panoply. Aside from the jaw-dropping action sequences, the movie has value in some of its character interactions, particularly Vision (Paul Bettany) and Scarlet Witch’s (Elizabeth Olsen) domestic scenes, and its topical subplot involving superheroes signing an agreement to refrain from using their powers a la The Incredibles (2004). Also lending the film some emotional heft is its too-real-for-comfort terror attack in Lagos, which is an echo of the Sokovia and New York City debacles in the Avengers films (and, of course, 9-11 in real life). An earlier assignment conducted by the Winter Soldier (Sebastian Stan), which is told in a series of flashbacks, also provides some decent, intermittent intrigue and factors into the climax in a major way. The list of returning heroes is extensive (consult IMDB) but it’s really the new faces that add the most to the film, namely: William Hurt as Secretary of State Thaddeus Ross, Chadwick Boseman as T’Challa/Black Panther, Emily VanCamp as Sharon Carter (Peggy Carter’s niece), Tom Holland as Peter Parker/Spider-Man and Marisa Tomei as Aunt May Parker. The Spider-Man subplot works extremely well and provides hope that the impending re-reboot of the franchise will be successful (and how shrewd of Marvel to give us a preview of that movie here…they’re the undisputed masters of cross-pollinating properties). With the exception of a few amusing one-liners and the eye-popping FX, there really isn’t anything else to evaluate here…other than the fact that the movie needed Hulk and Thor, both of whom are conspicuously absent from the proceedings. If you’re a fan of these films you’ll probably enjoy this one too. Even though Captain America gets overshadowed in his own movie, Civil War has successfully moved the Marvel franchise forward to Avengers 3 and beyond. There are two bonus clips during the closing credits, so don’t leave early. The opening reminds me of the #JungleCruise ride at #Disneyland. “Wolves don’t hide in trees.” Good to know. Nice #TimeLapse photography of the canyon transitioning into its dry season. “In some packs the runt gets eaten.” Survival of the fittest. I love seeing the respect for #Elephants. Magnificent creatures. That molting is as big as a tent. #Kaa is near. “Trust in me.” When someone says that you normally can’t. “That’s not a song, that’s propaganda.” Ha! #ShereKhan’s object lesson of the deceptive #CuckooBird is quite the traumatizing #BedtimeStory. One of #MowglisTricks saves a young elephant. Touching scene. #KingLouie really knows how to bring the house down. #ShereKhan is engulfed by the #RedFlower. Good riddance. Final analysis: a modern take on #Kipling’s classic with superb voice performances and jaw-dropping #CGI. A decent family film that sadly lacks the charm of the 1967 cartoon and the magic of the 1942 #Sabu classic. Rating: 2 1/2 out of 4. The target audience won’t be disappointed but adults may find fewer pros than Khans. Director Jon Favreau’s (Iron Man) reverent riff on Rudyard Kipling’s adventure classic The Jungle Book is a virtual remake of Disney’s 1967 kiddie feature only with blended live action and computer effects standing in for animated characters and locations. Though this film isn’t the sing-along sensation that the cartoon version is, a couple of the original songs can be heard here (“The Bare Necessities” and “I Wan’na Be Like You,” which is sung by Christopher Walken). However, the musical element is toned down and the action is ratcheted up in this particular Kipling outing. The film is also noticeably more adult than its pedestrian predecessor: both Shere Khan (Idris Elba) and King Louie (Walken) are far more menacing here. Although much of this film’s storyline was lifted right out of the 60’s flick, some story elements have been altered and/or new ones added to stretch out the action to a full-length feature. To whit, the Red Flower line in the “I Wan’na Be Like You” lyric is expanded into an entire subplot in this movie. 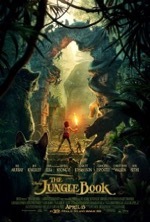 Another new passage is where Baloo (Bill Murray) convinces Mowgli (Neel Sethi, who not only looks the part but delivers a pitch-perfect performance) into knocking down some large honeycombs to sate the bear’s enormous appetite. It’s an amusing sidebar, but is a poor substitute for the scenes where Baloo teaches Mowgli how to spar and when the two new friends float down the lazy river in the original. Those scenes were charming; the ones in this film are merely amusing. While contrasting the films, there’s no doubt that the gold star for visual splendor and pulse pounding action scenes goes to this film, due in large part to the eye-popping computerized renderings of the menagerie of jungle creatures. The catfight between Shere Khan and Bagheera (Ben Kingsley) is appropriately feral and frenetic and the scenes with giant python Kaa (Scarlett Johansson) are effectively hair-raising. Sequences like the water buffalo stampede couldn’t have been achieved with such proficiency even a few years ago, much less with hand drawn animation techniques from the 60s. However, the superior visuals actually invite a possible criticism of this film. Since its narrative is so similar to the 60s animated feature, one wonders if this release was just an excuse to showcase the latest CGI—essentially a technical vehicle for the film’s FX. We’ve seen how green lighting a movie for the sole purpose of showcasing the latest visual effects has produced uneven or outright awful results, a la Star Wars: Episode I - The Phantom Menace (1999). This movie certainly isn’t that bad, but it is a tad perfunctory, what with its stock characters and connect-the-dots plot. The finest aspect of the film is its ending, which is a radical departure from the 60s movie and actually has more in common with the 1942 Sabu classic since animals must flee the devastating advance of the Red Flower in both versions. Unfortunately, the new nail biting climax can’t remedy this rote remake. All of this analysis is moot, of course, since the movie’s target audience will embrace the film regardless of the fact that it can’t stand up to the quality of its forebears. And is that such a bad thing? This film has updated the brand and introduced this timeless tale to a whole new generation of potential fans. There’s no downside there. Hardened critics and Baudrillard can go take a hike…or get lost on a jungle cruise.